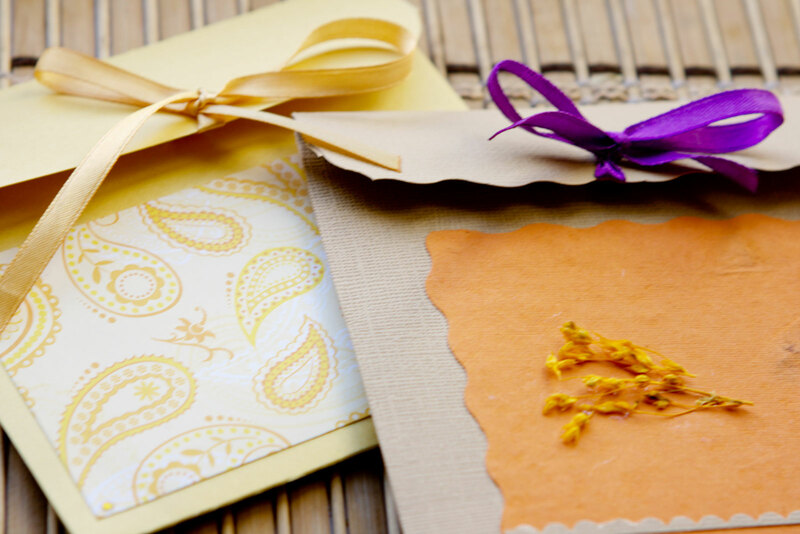 Unique handmade favors for your wedding! Greek koufeta sugared or flavored almonds! 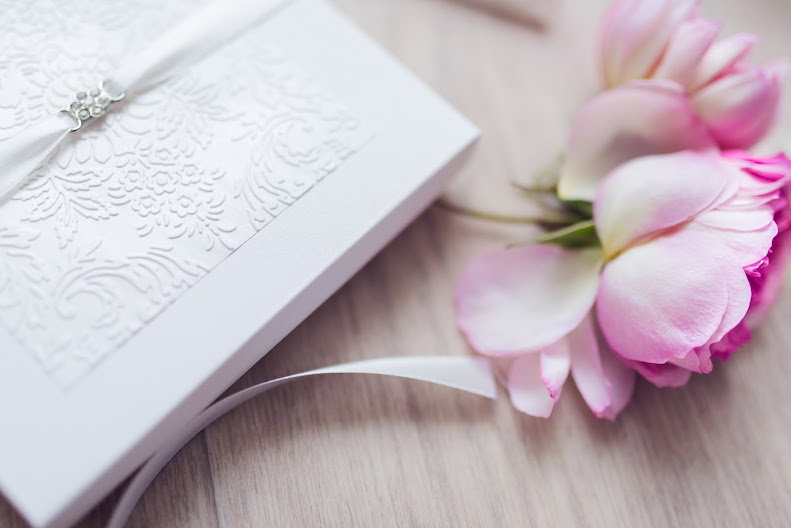 Bridal invitations for ceremonies in Greece! 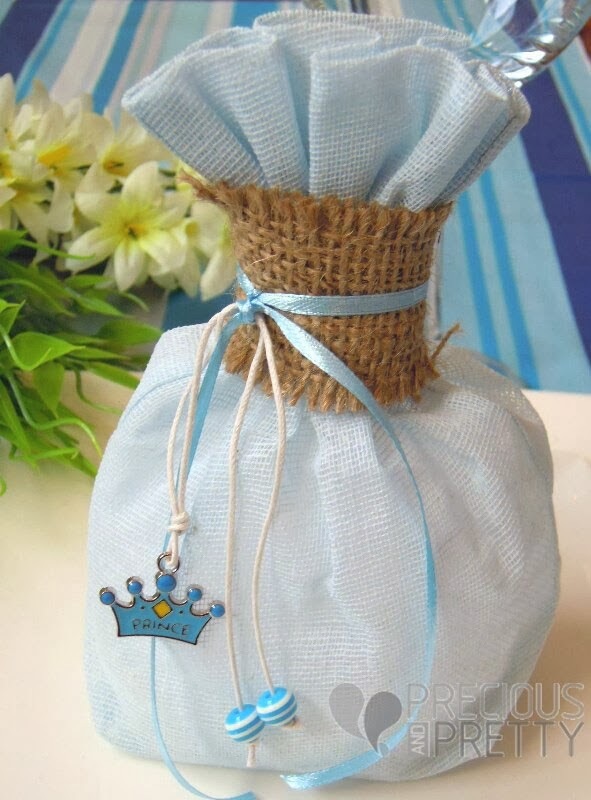 Prince favor bags for Greek Christenings or baby shower gifts, made with light blue linen pouches, tied in with burlap. The bombonieres are decorated with an enamel crown, beads and blue satin ribbon. It contains 5 koufeta (sugared almonds). 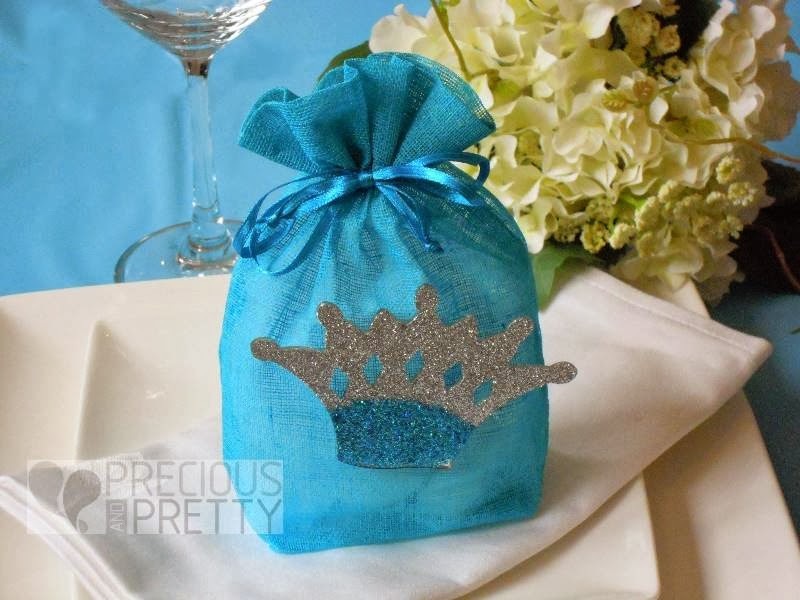 Crown favor bags for boy's Christening. Amazing Greek baptism bombonieres made with turquoise drawstring linen bags and decorated with an impressive glitter crown. The pouches are filled with 5 sugared almonds koufeta. 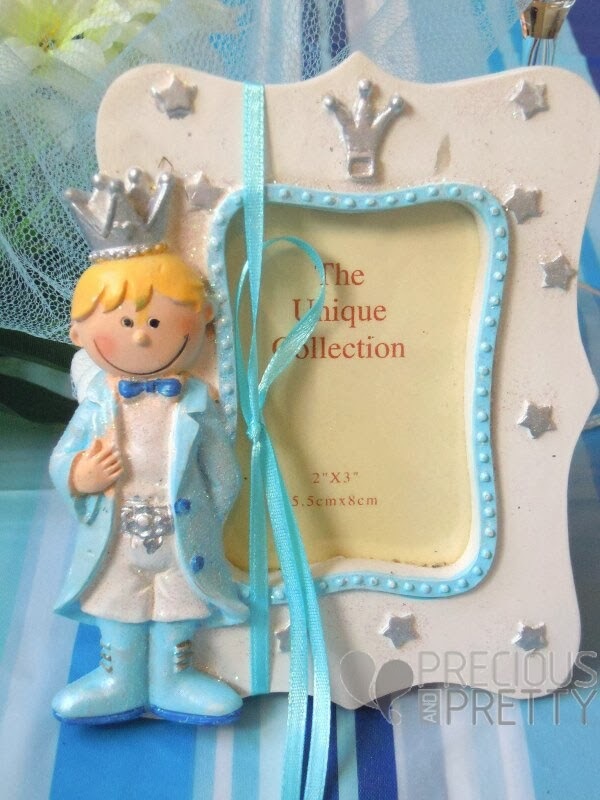 Prince frame favor for your baby's baptism or baby shower with the little Prince in blue color. 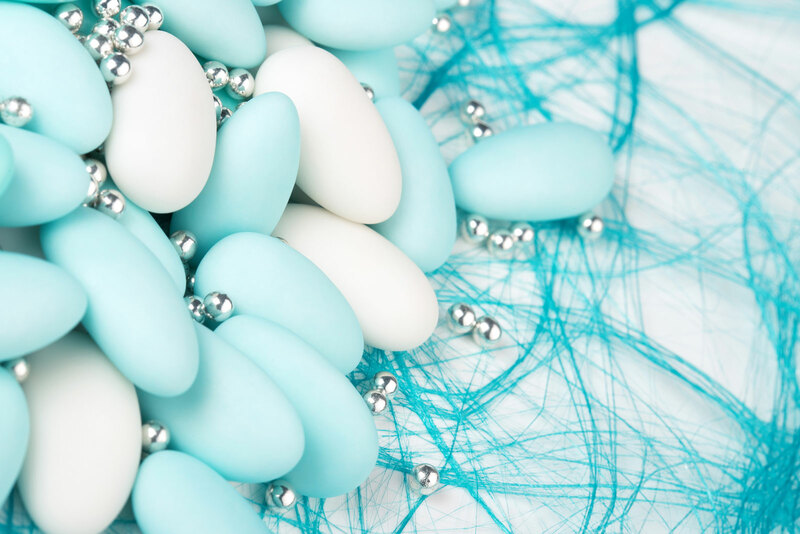 They are decorated with a light blue tulle filled with 5 Greek koufeta sugared almonds. The Rocking horse favor boxes are a nice choice for your baby's baptism. These Greek baptism bombonieres are made with light blue striped paper boxes, decorated with a Rocking horse charm and tied with the light blue organza ribbon. They are filled with 5 sugared almonds koufeta wrapped in a tulle. Cute Rocking horse Greek baptism boubounieres for baby boy. 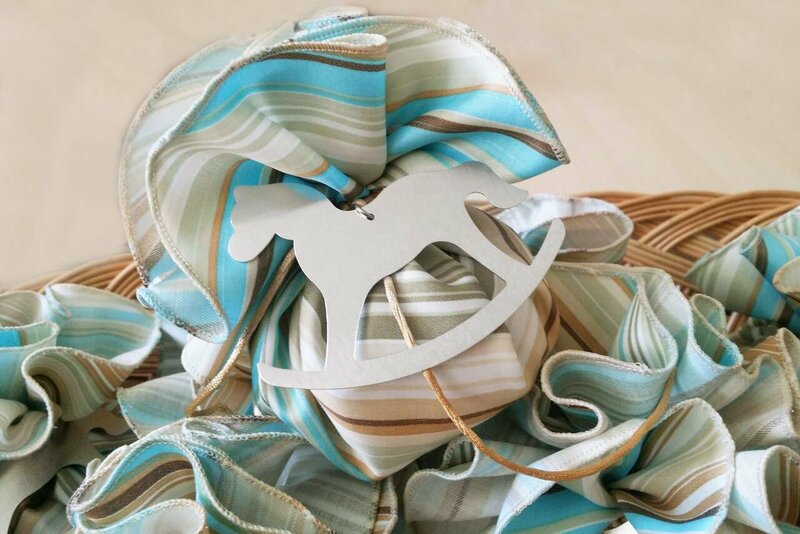 Handcrafted with blue-beige striped fabric, decorated with a Rocking horse ornament and tied with beige silk cord. Beautiful Christening favors filled with 5 koufeta sugar coated almonds wrapped in atulle. Baptism favor boxes made in Greece with green-white stripes, tied in a bow with two green wax cords. These bombonieres are also available in other colors and contain tulle with 5 Greek koufeta (sugar coated almonds). Size 6 x 6 x 4 cm (2.36' x 2.36' x 1.57' inches). 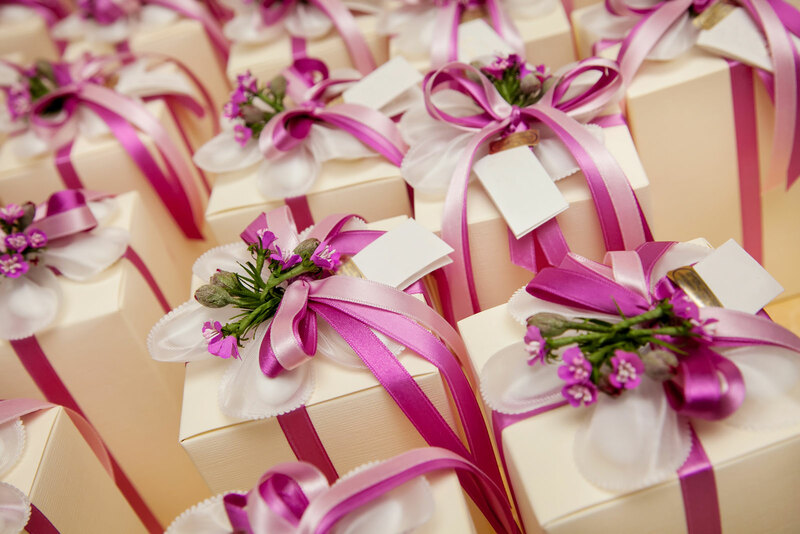 Cute polka dot favor boxes for Greek Christening of a baby girl or a baby box. Red polka dox boxes tied in a bow with red and white satin ribbons. These bombonieres are also available in other colors and contain tulle with 5 koufeta sugared almonds. Evil eye Greek mati baptism favors keyring for boy's Christening. Amazing bombonieres for boy's christening handcrafted with white gauze pouch and light blue tulle. They have been decorated with a keyring and light blue wax cord from which are hanging an evil eye charm in fish shape and striped blue beads. Thy favors are filled in with 5 koufeta (sugar coated almonds) wrapped in tulle. Height 16 cm (approximately 6.30' inches). Impressive Greek Christening favors with a crown charm for boy's or girl's baptism say. 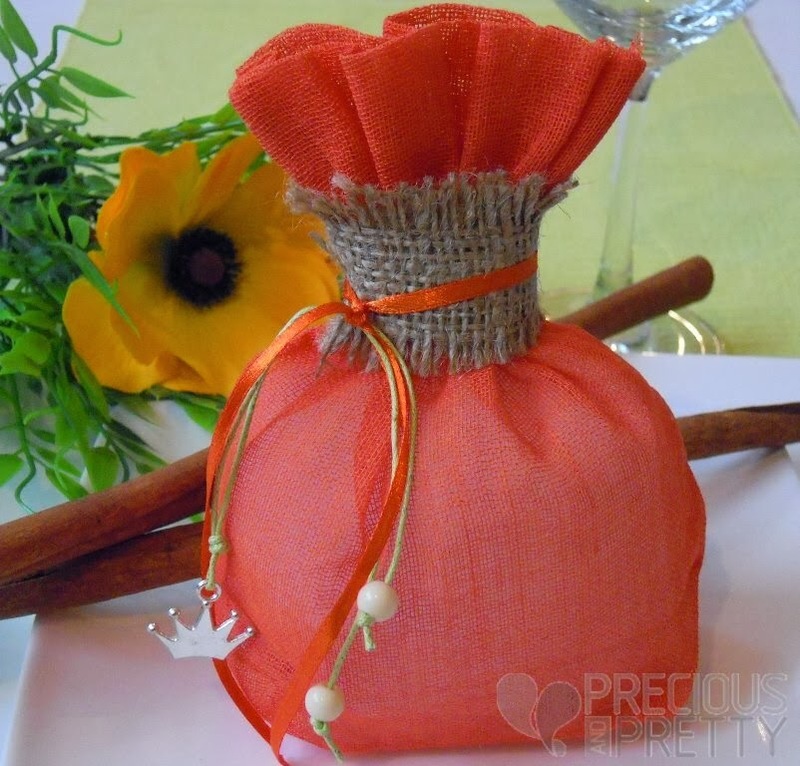 The gauze pouch in bright orange, the burlap in natural color and the distinctive decorative crown with the ivory beads, make a unique favor for your baby's baptism day. They contain tulle with 5 sugar coated almonds (greek koufeta). Baptism favors bags for Greek Christenings with seashells for baby boy, made with plaid navy blue-white fabric, tied with burlap and decorated with a natural shell. It contains 5 koufeta (sugared almonds) wrapped in tulle. 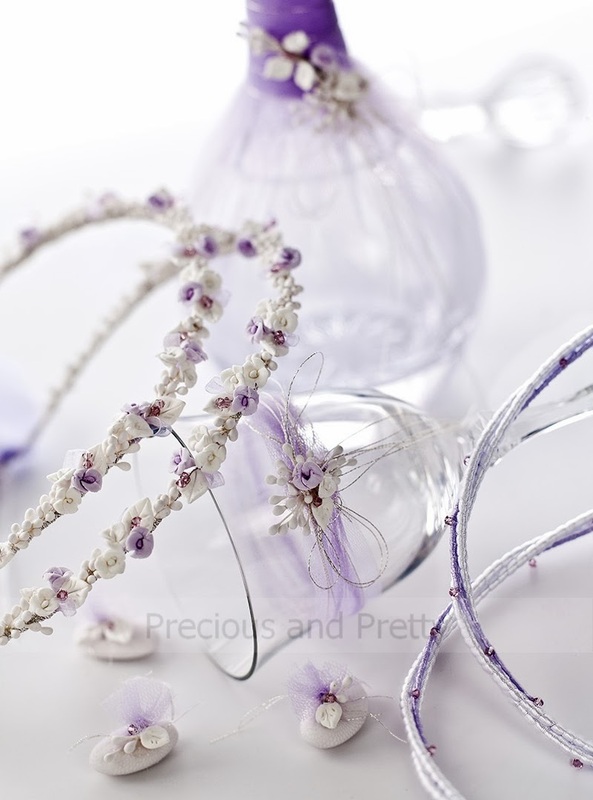 Greek wine decanter set and crowns Stephana with lavender flowers. Handmade wedding stefana crowns with flowers white-lilac, bonded with lemon blossom. This beautiful stefana are combined with crystal decanter, wine glass and koufeta (sugar coated almonds), all embellished with lavender tulle and the same design of the stefana. 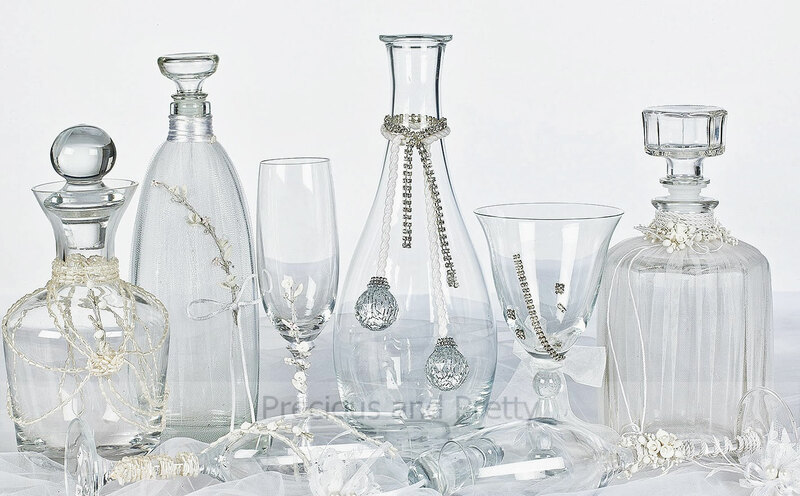 The wedding set can be decorated differently, depending on the stefana you will from our collection. The crowns include a case and two groom's buttonhole pins. Crowns size. One size. Diameter 21 cm approximately 9 inches. 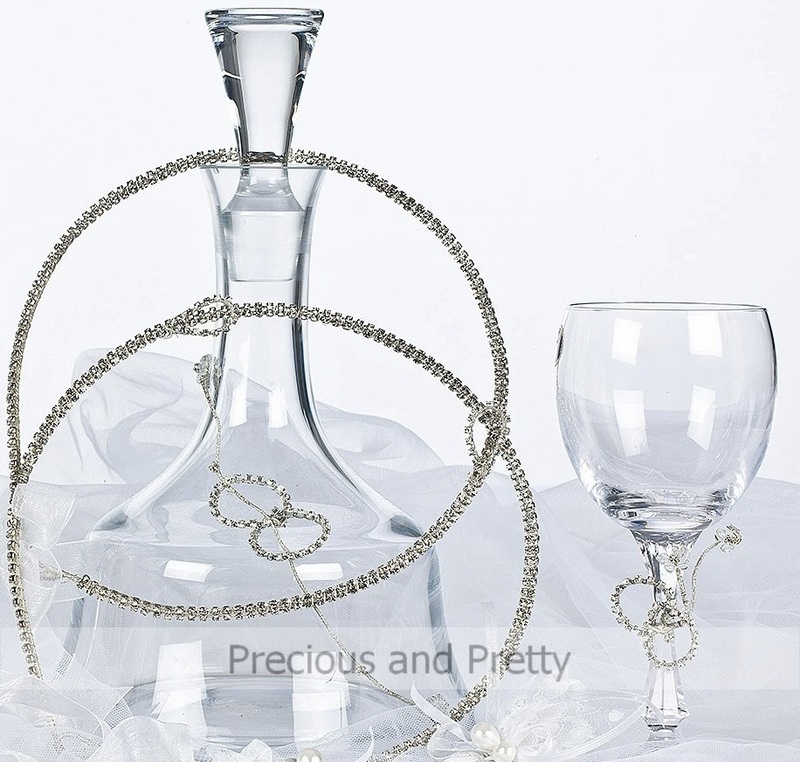 Crystal decanter and wedding champagne glass set, embellished with silver cord and white porcelain rose. 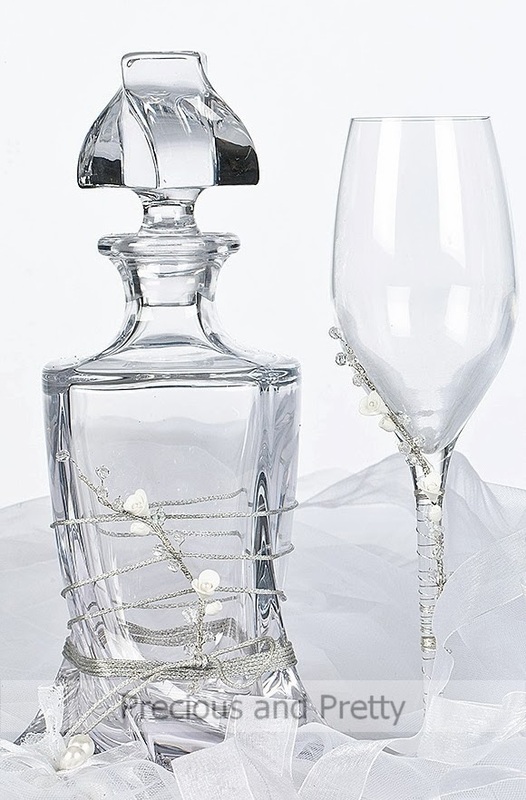 Crystal wedding carafe in modern style and wine glass with rhinestones embellishment. Matching handcrafted wedding stefana. 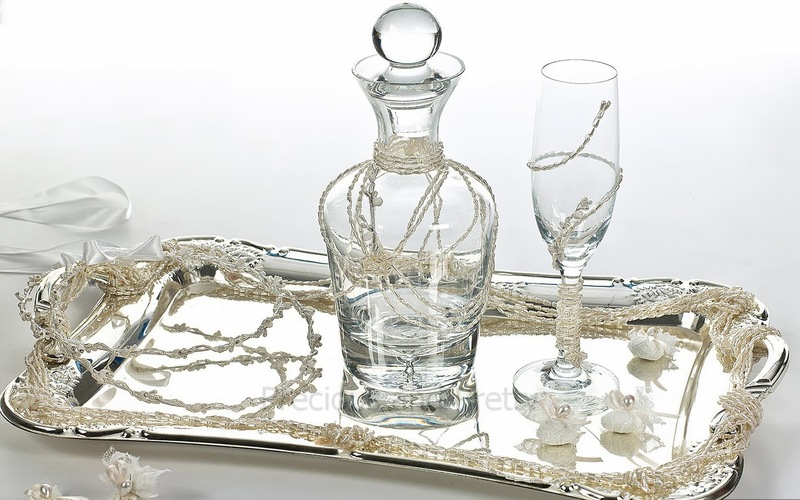 This beautiful vintage wedding set, includes a silver plated tray, crystal carafe, wedding crowns and wine glass, all embellished with ivory pearls and porcelain roses. 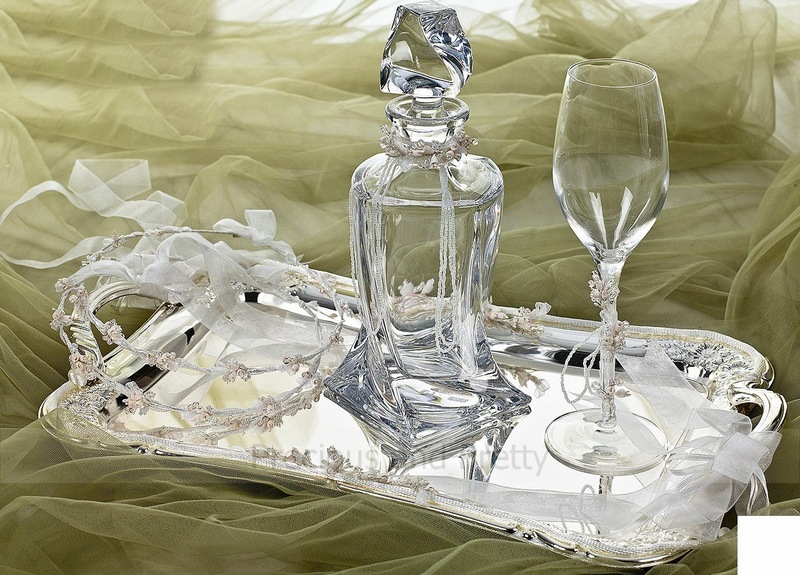 Wedding crystal decanter, champagne glass and antique style silver plated tray, embellished with white beads, pink porcelain flowers and pine rhinestones. During the last few years, we have helped hundreds of couples to create the appropriate “atmosphere”, that suits their taste, their needs and their dreams. We have learned to pay attention to any detail that will make a difference. To respect money and time so as to adjust our proposals accordingly.